Six on Saturday – March 24th – no snow! The weather improved after the snowy Sunday, which meant we had a chance to finally get some work done on the allotment. So here’s my Six on Saturday with no snow in sight! 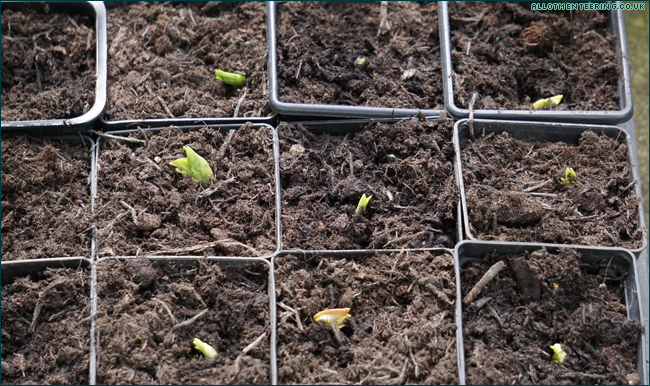 First up are the Broad Beans…. earlier in the week we had none, now we have 9! Just a few (!) 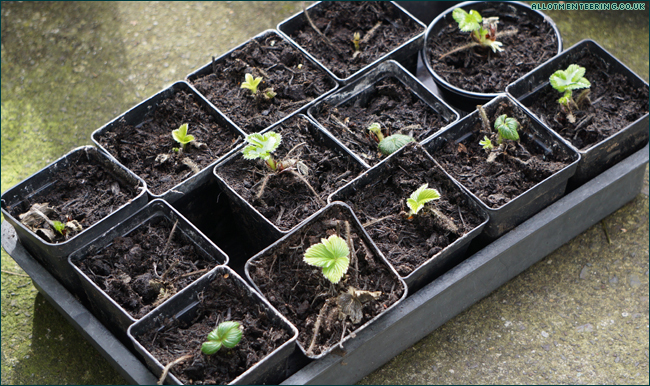 more needed for 100% success rate, but hopefully the warmer weather will encourage them to get growing. 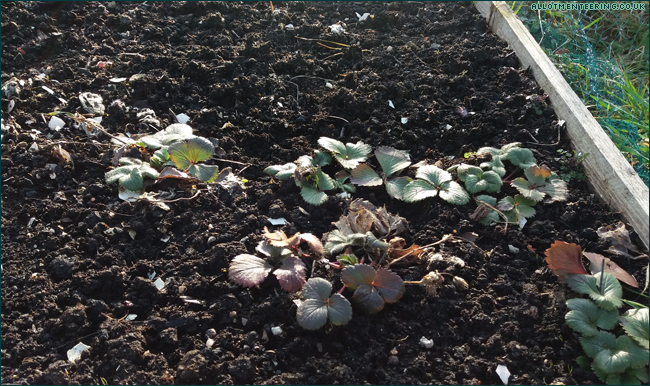 ….on the allotment, the ones I planted under fleece last year are looking great! 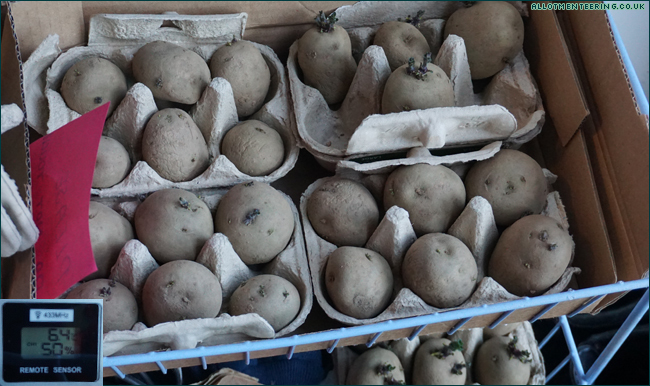 A quick chitting update on the potatoes – the first earlies are still looking like they’re hardly doing anything (egg box to the top left in particular), while the second earlies look almost ready to plant out! I put my weather station sensor on the rack next to the spuds to see what the temperature was – it’s been about 6C during the cold snap this week, but on Thursday was more like 13C. Hopefully that extra warmth will encourage those first earlies to get a move on! On to the strawberries now, and the ones that were partly covered with snow from earlier in the month. These are white-fruiting strawberries, and most look like they have fresh growth – next month they’ll be planted out in the raised bed (once I’ve laced some twine through the net to close up the holes – these nets rip far too easily!). And the new addition (last year) on the allotment, pink-flowered “Just Add Cream” which is actually looking better than some of my older ‘regular’ strawberry plants! 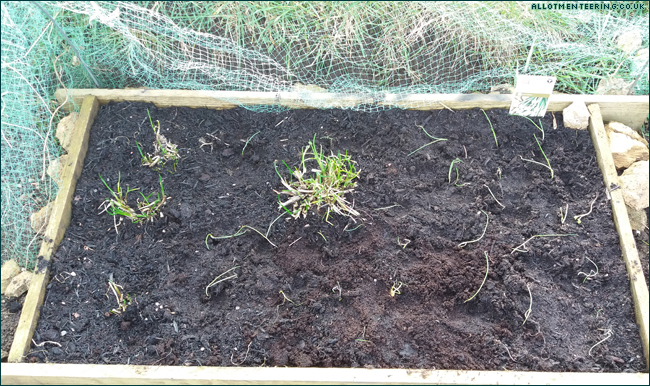 I thought I’d better plant out those new Spring Onions from last week (the packaging says “plant out as soon as possible”), so I spent a while carefully separating each plant. Not only did it fill my newest half-sized raised bed (avoiding where I planted the chives of course), but I had three left over, which went into the raised bed with the Just Add Cream strawberries. 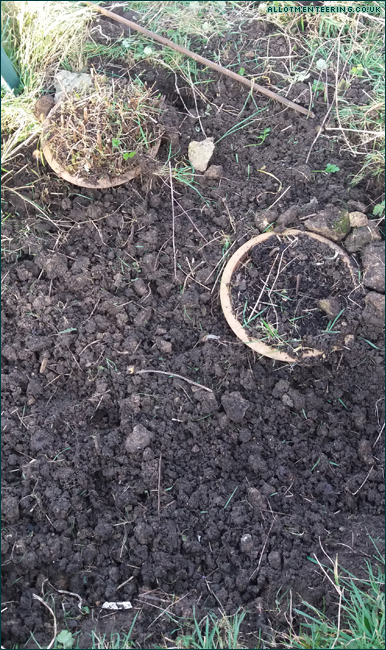 I dug up the oldest lavender plants, and tried digging over the soil in preparation for the pea plants. About 3 inches below the surface, I kept hitting stones so I think this bit is in need of a thick layer of fresh compost before anything gets planted in it. The two pots house two mint plants – the one on the left was so compacted, I couldn’t loosen any of the soil to try and get the weeds out. 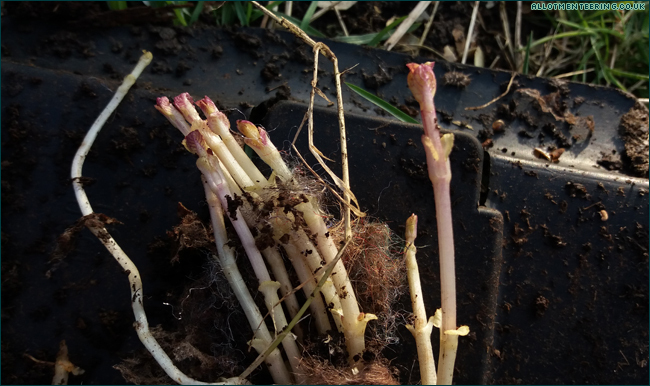 And finally, a “mystery compost plant”…. yes, you read that right. I needed to get some compost out of the bin and discovered a lot of these little plants growing in the top. But I haven’t a clue what they are! We did bin these, as we didn’t want to find it was a weed we didn’t want to keep, but does anyone have any idea what they could be? I think there’s possibly more growing in the compost bin still! Intrigued by ‘Just add cream’ strawbs. Looking forward to pics! I just hope the fruits taste as good as they sound! 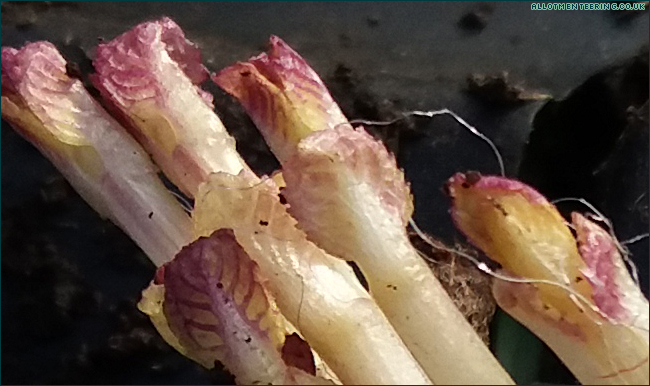 Your mystery plants – I don’t recognise them, but what’s been tossed in there? One year, I had scads of avocado growing in mine, so whatever you’ve put it, it’ll grow. I like your onions in w/the strawberries. Splendid use of space, if the onions get going upward before the strawberries start to spread their elbows out. This year, I’m putting my onions & leeks in front of my rose bed. I’ve found tomato plants growing from the compost before, but that was out on the allotment rather than in the bin itself. But everything from tea bags to salad stuff (so tomatoes, potatoes (I actually threw out two I found in there, as they’d started sprouting), carrot) and anything like rhubarb and raspberries from when they died back / were cut back for the winter along with spinach which grows wild on the plot. But there’s also some wild flowers which grow around the base of the plant, and some mint plants nearby which escaped from their containers…. because the compost bin is just sitting on the soil rather than a hard surface, it’s possible a nearby plant has sneaked in while I wasn’t looking! Hopefully I’ve left enough space for the strawberries to spread out without reaching the onions – last year I tried growing onions in with the other patch of strawberries, and they were so close together than the onions just didn’t stand a chance. I’ve never tried growing leeks – are they hard to grow? My broad beans haven’t germinated at all this year and I think it is probably too late to sow indoors now? The ones you planted last year are looking good – maybe that is the way forward. 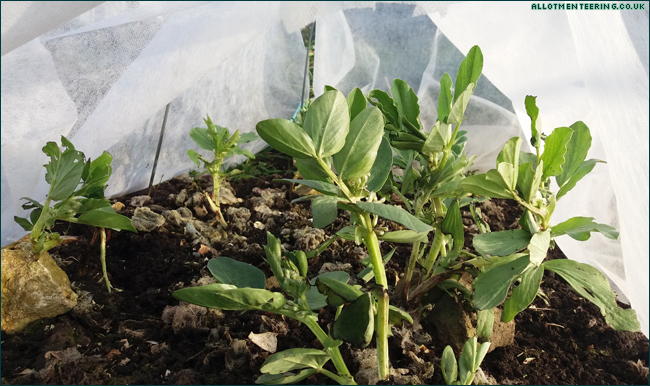 A few years ago someone suggested that I sow the broad bean seeds outside in the late autumn, as they’re meant to then be less at risk from blackfly in the spring. It doesn’t always work that way (last year they were still covered with blackfly), but it means I get some early beans out of it!